Photograph by flickr user Matthew Straubmuller. What is the connection between the issue and food insecurity? What is the socioeconomic impact? What policies exist in other places to address the issue? The project was a dream match for my skills and interests. I was engrossed in the research, much of which was in Spanish and included reading the Bolivian Constitution and national agricultural policies, digging for data from the Food and Agriculture Organization’s Statistics Division and the World Bank’s World Development Indicators, reading academic papers regarding food security in Bolivia, and identifying case studies from around the world as potential policy approaches to improve food security. As a dual masters degree candidate in the Agriculture, Food & Environment and Urban & Environmental Policy & Planning programs at Tufts University, I was able to integrate my non-law perspectives on policy, planning, and public health. However, this was also a learning experience in recognizing how comfortable I am with the jargon of my field and how I need to adapt my writing to be accessible to a broader audience. 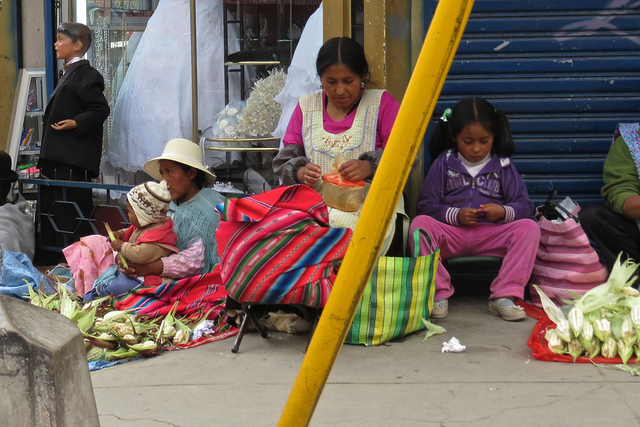 My research culminated in four recently published policy briefs that explore the links between food insecurity and issues of particular social and political interest in Bolivia – specifically nutrition, global food trade, urban poverty, and gender inequality – and offers recommendations for policies to address food insecurity. 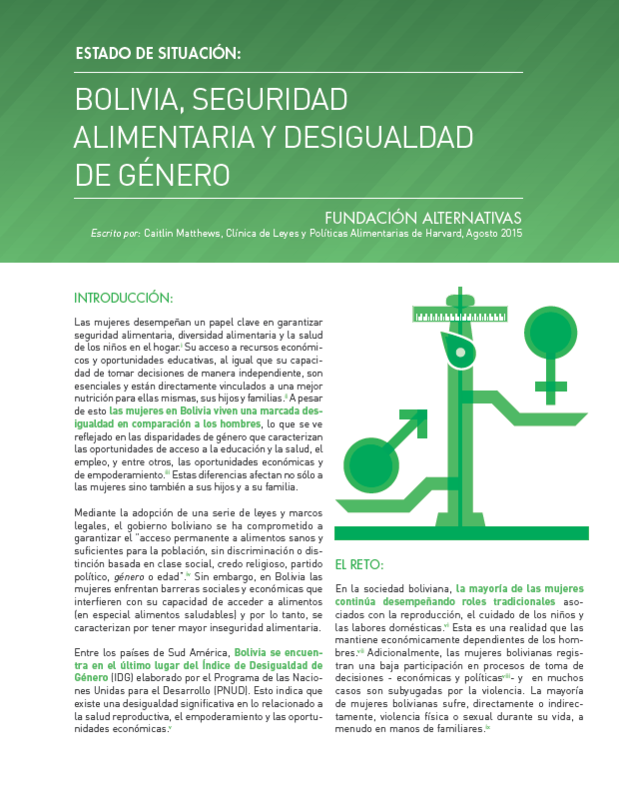 Fundación Alternativas will use these briefs in their outreach to elected officials and diverse civil society organizations in order to heighten awareness of the challenge of food security, its connection to other pressing issues in Bolivian society, and potential policy approaches to improve food security. Working with María Teresa and Fundación Alternativas has been an expansive academic and professional experience, and is one that I hope to continue. I have recently applied for research funding to collaborate on data modeling and spatial analysis to inform policy making and policy implementation to strengthen the food system and food security in the La Paz metropolitan region. Originally published by Boston Business Journal on February 19, 2016. Written by Jessica Bartlett. Harvard Law School has filed a class action lawsuit against the state of Washington’s Medicaid program, challenging a provision that denies expensive Hepatitis C to many patients enrolled in the program. The university also has hinted that its Center for Health Law and Policy Innovation may also take legal action against Medicaid insurers in Massachusetts, where restrictions on using expensive hepatitis C drugs are common. The Washington lawsuit’s proposed class of plaintiffs includes Harvard as well as patients who say they were denied hep C medications as mandated by the state’s Medicaid program. The Washington State Health Care Authority currently restricts access to certain Hepatitis C drugs, such as Harvoni, to Medicaid members only with severe liver damage. The hepatitis C drugs, known as direct-acting antiviral medications, have gained notoriety not only because they cure people affected with the disease, but because of their lofty pricing. For example, a course of treatment for Harvoni runs $94,500. Harvoni is made by Gilead Sciences (Nasdaq: GILD). The lawsuit was filed jointly with Columbia Legal Services and Sirianni Youtz Spoonemore Hamburger. Costello estimates that there are several thousand Washington residents on Medicaid who have been denied access to Hepatitis C drugs. The lawsuit is the second to be filed nationally against a state Medicaid program, Costello said, noting there is also a lawsuit against Indiana’s Medicaid program. Harvard is not involved with that case. Harvard said additional legal action may be targeted at local Medicaid insurers, some of whom have restrictions for direct-acting antivirals. Costello said patients enrolled directly through MassHealth have unrestricted access to drugs like Harvoni, however patients covered by managed Medicaid insurers restrict access. “It’s not OK to MassHealth members — one in fee for service and one in a managed care organization — to have disparate benefits provided to them because of the avenue they receive their benefits. We think that violates the law,” Costello said. The Harvard Center for Health Law and Policy Innovation, as part of the Massachusetts Viral Hepatitis Coalition, wrote a letter to Massachusetts Attorney General Maura Healey on Jan. 11 requesting she investigate the benefit differences for MassHealth members. Costello said the Center is also investigating other enforcement options. A February 19, 2016 article published by Rhode Island Public Radio discusses recently filed litigation to challenge the Washington State Health Care Authority (WHCA) and its restrictions to medications to treat Hepatitis C.
In “Second State Sued Over Hepatitis C Medication Access,” reporter Kristin Gourlay interviews CHLPI’s litigation director and senior associate director Kevin Costello on the class action lawsuit, filed by CHLPI, and Washington-based Columbia Legal Services and Sirianni Youtz Spoonemore Hamburger. 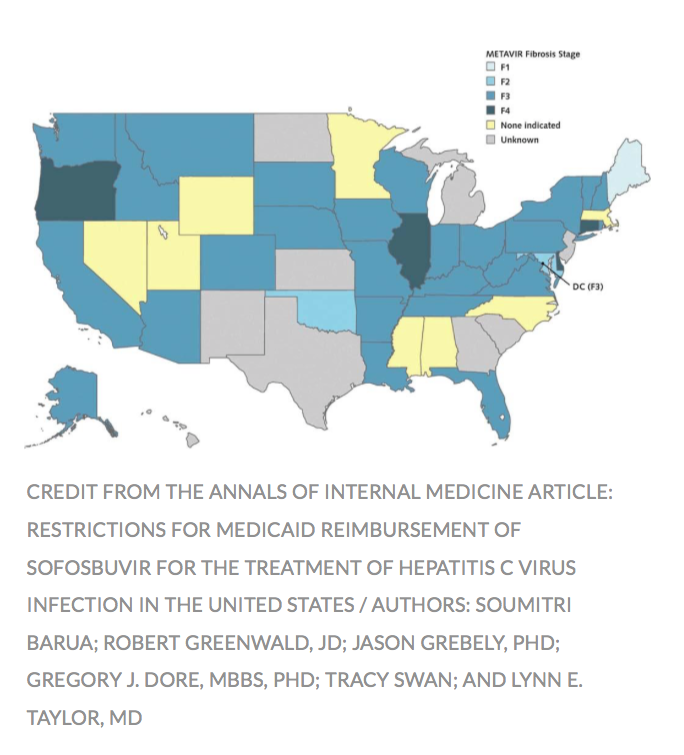 Read “Second State Sued Over Hepatitis C Medication Access” in full. Who worked to produce your lunch? On February 9, 2016, three members of the Alianza Nacional de Campesinas (National Alliance of Female Farmworkers) came to Harvard Law School to speak about the injustices that female farmworkers face on a regular basis.The Alianza works to empower and educate female farmworkers about their rights, creating a network of women and organizations that support their interests. Dolores Bustamante, Beatriz Gatica, and Hormis Bedolla each shared poignant stories that illustrate the difficult realities that female farmworkers tolerate while working in agricultural operations in the United States. Many of these female farmworkers are undocumented, and the constant threat of deportation often prevents them from speaking out when their rights are violated. They described how female farmworkers often experience sexual assault and domestic violence, both at work and at home. However, women rarely raise these issues. Oftentimes, female farmworkers are highly dependent on both their spouses and their workplace for housing and financial support, and speaking out may compromise their job and income security. Farm labor is grueling work. While in the field, farmworkers wear large sweatshirts and bandanas to protect themselves from the harmful pesticides used in crop production. In spite of these inherent dangers, they often receive below the minimum wage. The Alianza members explained that they often receive payment through an intermediary, who may take a large cut of their wage. Agricultural workers are exempt from the Fair Labor Standards Act. Accordingly, they are not entitled to overtime pay, vacation, or holidays. They are not allowed to unionize. Given this gross imbalance in bargaining power between farmworkers and their employers, it is difficult for them to object to the frequent labor abuses that they experience. Nor does law enforcement provide a viable outlet for their complaints. Dolores spoke of a personal encounter with the police, who wrongfully detained her without cause and threatened deportation. She was released only after the Alianza stepped in on her behalf and threatened to expose the police department’s wrongful behavior. The women shared a simple request with the classroom full of law students: to be afforded the basic human rights of fair compensation, personal health & safety, and freedom from fear of deportation. On February 15, 2016 the Harvard Law School Center for Health Law and Policy Innovation (CHLPI) spearheaded the filing of an amicus brief to the U.S. Supreme Court in Zubik v. Burwell, the next major challenge to the Affordable Care Act (ACA). The brief requests that the Court affirm multiple Courts of Appeals’ decisions upholding the federal Government’s choice to maintain access to no cost contraceptive services in health plans sponsored by employers, including religious non-profit employers. CHLPI and the other signatories submitted this brief to advocate for employees’ right to make their own medical decisions, without interference from their employers, and to protect our health care system’s ability to effectively respond to public health crises. Read the full press release about CHLPI’s amicus brief for Zubik v Burwell. The Harvard Food Law and Policy Clinic (FLPC), in partnership with Racing Horse Productions, today released the short film EXPIRED? Food Waste in America in the Los Angeles Times. EXPIRED explores how misleading date labels on food products contribute to food waste in America. Every year, 40% of the food produced in the United States goes uneaten, leading to 160 billion pounds of wasted food in our landfills. As FLPC explained in its 2013 report, The Dating Game: How Confusing Date Labels Lead to Food Waste in America, the date labels on food products are a major cause of this unnecessary waste. Because the federal government has no standardized regulations for these dates, labeling practices are governed by inconsistent state regulations and industry discretion. As a result, the date labels consumers see on foods –“use by,” “best before,” “sell by”—are misleading. Most consumers believe that date labels are safety indicators, when in fact, the labels are meant to indicate when food will be at its peak taste. Although there is no uniform regime for determining these dates and they are not related to safety, states often regulate the sale or donation of food items after the date listed on the label. This confusing system leads manufacturers, retailers, and consumers to discard food that is perfectly safe to sell or eat. FLPC is calling for the creation of a federal law that would standardize the date labels allowed on food products in order to clearly distinguish between quality and safety dates. This can reduce consumer confusion, simplify regulatory compliance, and cut food waste across the supply chain and in consumers’ homes. This law should also bar states from prohibiting sale or donation of food after its quality date. With the release of this film, FLPC aims to raise awareness about the consequences of confusing and non-science-based date labeling, and about the impact that a uniform labeling standard could have on reducing food waste. “We believe EXPIRED will be a powerful catalyst for change by offering a visual and visceral understanding of the problem, raising awareness about ways to combat it, and engaging key stakeholders in the issue,” adds Richman Cohen. For more information and to view the film, please visit www.notreallyexpired.com. 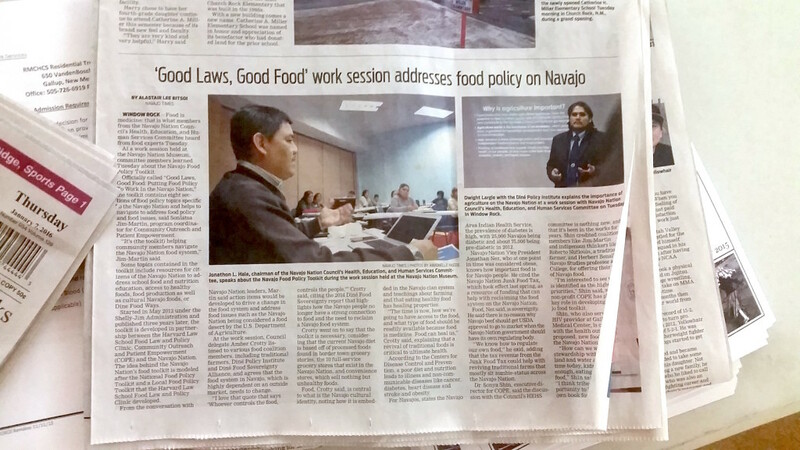 I spent two weeks in the Navajo Nation as a Continuing Clinical student for the Food Law and Policy Clinic. I had been working on food sovereignty research for a partner in the area during the Fall, but could not comprehend the true depth of the challenges facing the Navajo Nation nor the passion and knowledge of its food advocates until I had the opportunity to visit it myself. During my time there, I was able to see advocates and government representatives working together to solve the complex food issues on the Navajo Nation, while also getting to see the work organizations are already doing, specifically to address chronic illness and increase food access. In Window Rock, Arizona, the seat of government for the Navajo Nation Council, I had the opportunity to join a coalition of diverse advocates working toward food sovereignty. Indeed, the Nation seems to be on the precipice of real reform. I attended a committee meeting and a work session of the Health, Education and Human Services Committee (HEHSC) where representatives used the Good Laws, Good Food toolkit, created by FLPC and partners, as a jumping off point. Through these sessions and later meetings with other food advocates and coalition partners, I met key officials that lent insight into the work being done in education, food assistance, and agriculture among others. During my stay, I was hosted by a partner organization, Community Outreach Patient Empowerment (COPE), a sister organization of Partners in Health (PIH) that works with the Navajo Nation to address chronic illness through education and outreach. Sonlatsa Jim-Martin, the COPE REACH Coalition Coordinator, invited me to participate in a wealth of events and experiences throughout my stay. I was able to get involved in a number of different projects with which COPE is affiliated. I spent one weekend with the Navajo Community Health Outreach (NCHO) Youth Leadership, working with young leaders who serve as public health champions in their communities. Not only did I have the privilege of learning about the role of food in Navajo traditions and culture but I got to witness the variety of public health projects they were creating, such as a campaign to share traditional wisdom on food in local chapter houses. Later in my stay, I went with the COPE team to a clinic on the opposite end of the reservation to check in with the FVRx program at Monument Valley Clinic. FVRx, or the Fruit and Vegetable Prescription Program, was developed by Wholesome Wave, and enables community healthcare workers to provide health and nutrition counseling coupled with prescriptions for fruits and vegetables that can be redeemed at local stores. Along with store owners and community members, the COPE team planned not only how they would recruit eligible mothers and children, but how they could adjust the education component and vendor partners to best serve their patients. On the way, we stopped at several food vendors as part of COPE’s Healthy Stores Initiative, to give them equipment to facilitate the sale of produce and provide them strategies to make the most of selling healthy food. 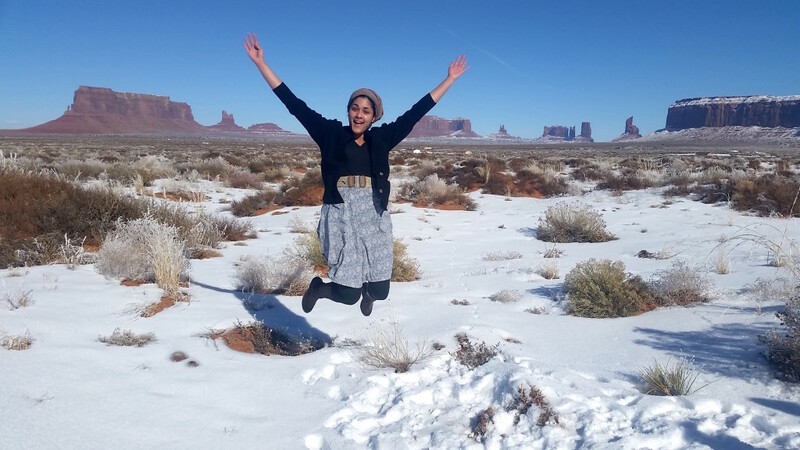 My time in the Navajo Nation not only provided an enriching complement to the research I had completed in the Fall, but gave me greater insight into the inspiring power of food to bring people together in inspiring and unexpected ways.